Have you ever heard John Denver, the soundtrack to Les Misérables or the Game of Thrones theme song clang throughout campus – and wondered who in the world was creating such a lovely sound? The melodies seem to come from nowhere, at random times, and they last for hauntingly few minutes. Many students smile to ourselves as we hear the Harry Potter theme song as we bike or walk across the quad and continue with our busy days as if nothing magical wafts through the air. So what is behind the sound? The real question, however, is who: 11 dedicated students who, in shifts, ring Thompson Chapel’s carillon, an imposing wooden structure connected to the bells that these students whack 21 times a week, three times a day. Using only one major octave – the carillon is in E flat – and a few extra notes, these musicians provide the campus with around 30 minutes of music each day. “When playing the bells, you work up a sweat, especially when you’re small,” Caroline Hung ’19 said, explaining that players must jump to hit all the notes on the giant instrument. Even the way up to the tower is tough. Climbing the 46 steps to the carillon can be a “workout,” Ziev Dalsheim-Kahane ’19 said. Besides being physically demanding, ringing requires immense focus and adaptability. So much of the music we hear is sight-read by these dexterous performers. 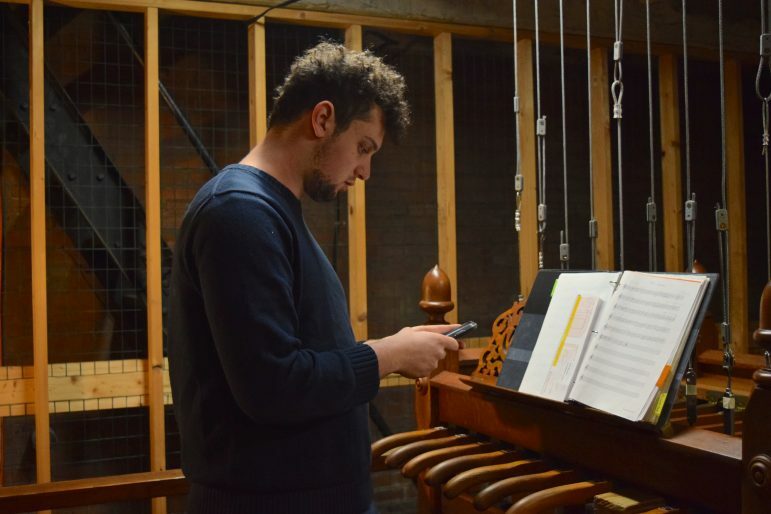 Students tend to have three shifts a week, each of which requires them to climb the two-and-a-half flights of stairs up the tower, a reproduction of St. Cuthbert’s Church in England, to play the bells. Yet bell ringers have quite an audience. The bells can be heard from miles away, exciting dogs and residents alike. Although the guild members never receive the applause they deserve after a performance, Dalsheim-Kahane likes to think students can relax because of his music and that perhaps a song they recognize can calm them during a stressful day. For this reason, he “gives the people what they want,” usually clanging out Beatles classics, hip-hop and appropriately-timed movie themes, as well as some meme songs. The tunes come from several binders of sheet music, all transcribed by former and current bell ringers. The music sits in piles for the ringers to choose during each shift. “I looked up to a lot of the former seniors because they had done so much, contributed a lot to the repertoire,” Angela Chan ’19 said. For some students, ringing the bells in the chapel is connected to spirituality. Hung, who has been involved with religious life at the College, heard of the group through Rick Spalding, former chaplain to the College. Hung likes to find hymns in St. John’s Episcopal Church and transcribe them for the carillon to spread throughout campus the music that brings her joy. Spalding, who maintained the guild for many years, inspired Hung’s passion for the carillon. Hung still remembers what Spalding said about the sound of the bells during one of the yearly dinners he hosted for the ringers. For him, they were a reminder of times passing, a sign that life is always going on. Moreover, Hung likes to get people excited, whether through classic songs or modern hits. Although he “bungled” his audition, he was offered a spot on the team, with a large perk being that ringing is a paid job on campus. Anyone who can read music is “more than capable of playing the carillon,” he said. And even if you fail to make the guild, auditioning can give you the once-in-a-lifetime experience of clanging out a tune on 10,762 pounds of hundred-year-old bronze bells to be heard throughout the town.